Bullfight tickets to Valencia bullring. 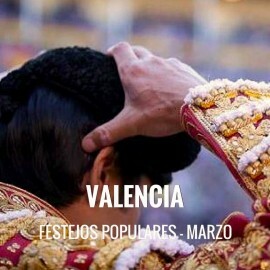 Fallas fair - Popular bullfighting festivals 2019. Fast and secure online ordering. Immediate information of all the Bullfighting Festivals. A virtual store with the most powerful technology and design of the sector. Easy navigation, transactions with high security and confidentiality of data. Fallas - Popular bullfighting festivals: March 10th, 15th, 17th.